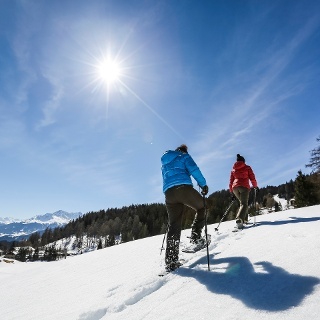 This tour over the Dreibündenstein connects the regions of Chur and Lenzerheide for snowshoe hikers. Great vistas and an optional downhill run experience make them a real insider tip. 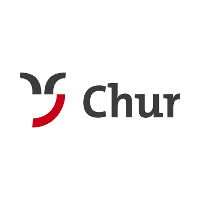 Near the historic part of Chur, the aerial tramway takes off in the direction of Brambrüesch. The holiday spirit is already in the air here: the short ride along the ridge offers a marvellous view of Switzerland’s oldest town. 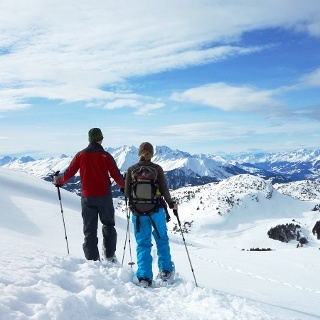 Once arrived on the hilly plateau, you can set foot on the scenic Alps and marvel at the panorama with mountains around Arosa, Schanfigg and Lenzerheide. Through the forest the trail continues until the glade at Spundis, where the panorama opens up to the other side. At the horizon the impressive Tödi can be seen, during the further ascent the Calanda and Ringelspitz dominate the scenery. And soon comes the next targe: the chairlift station at Hühnerköpfe. Below of the chairlift the trail continues in direction of the highest point of the tour. At the Dreibündenstein with its stone monument of the former Three Leagues of Rhaetia, you can admire a 360-degree panorama extending from the town’s home mountains surrounding Chur, the Arosa and Lenzerheide, up to the Glarus Alps. Well visible on the Ringelspitz, lying opposite and reaching up to the Flims Mountains (Segnes, Tschingelhörner) is the UNESCO World Heritage site «Tektonikarena Sardona» (Glarus thrust). 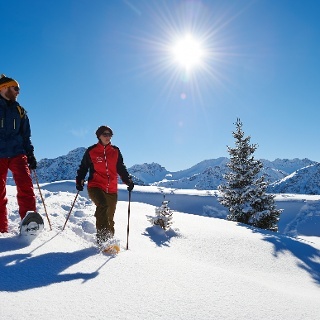 You can start out on the snowshoe hike in Brambrüesch or Pradaschier. Either way: those who would like to can end the hike with a downhill run experience. Switzerland’s longest luge track promises a big adrenalin boost. From Brambrüesch, you can ride on a rental sled down to the Känzeli mid station. 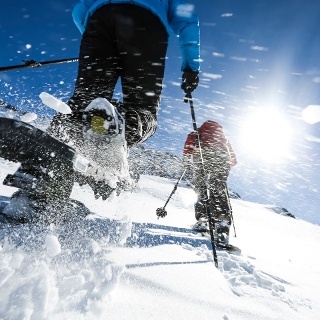 Flexible snowshoe rentals are offered in Brambrüesch as well as in Churwalden (rent on site / return at the destination). A special tour ticket can be purchased at the mountain cable cars, which along with all cable cars also includes the return trip by postal car to the place of departure. Please stay on the recommended route and stick to existing tracks (keep out of wildlife reserves). Schöne Tour mit herrlichen Ausblicken in die Bergwelt. 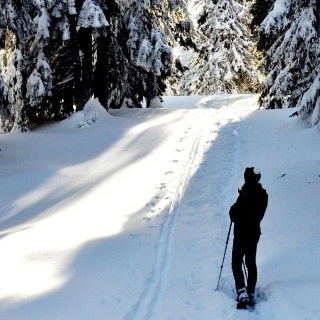 Allerdings führt sie am Anfang und am Schluss der Skipiste entlang.